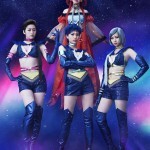 We finally got our first look at Sailor Galaxia and the Sailor Animamates for the upcoming Sailor Moon Le Mouvement Final musical this past week. 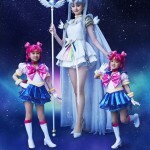 The Sailor Animamates are Sailor Guardians who are being controlled by Galaxia. The photo includes Sailor Lead Crow, Sailor Iron Mouse, Sailor Galaxia, Sailor Tin Nyanko and Sailor Aluminum Siren. We’ve also gotten another photo including the entire cast, the rest of whom we’d already seen with previous announcements. We also previously had cast information about these characters. 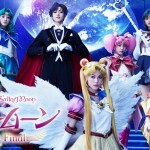 Coco Isuzu is Sailor Galaxia, Shion Aoki is Sailor Iron Mouse, Miyu Hashigaki is Sailor Tin Nyanko, Yuka Kobayashi is Sailor Aluminum Siren and Iriya Yuuto is Sailor Lead Crow. In the second photo we see that Sailor Galaxia and her Sailor Animamates are on the ground while the rest of the Sailor Guardians are all flying! Will we be seeing some fancy wire work in this musical? This entry was posted in Sailor Moon Anime (1992) and tagged Coco Isuzu, Galaxia, Iriya Yuuto, Le Mouvement Final, Miyu Hashigaki, Sailor Aluminum Siren, Sailor Animamates, Sailor Iron Mouse, Sailor Lead Crow, Sailor Tin Nyanko, Shion Aoki, Yuka Kobayashi by Adam. Bookmark the permalink. Great news for musical fans. I just hope that they have news about crystal already. As much as I am excited for musical fans I do not really care about the musicals. Why can’t Toei give us some good news? We waited a whole year and the next musical is about to start. I was hoping to have been watching the 4th season by now. I agree with you: indeed, they may rather be waiting for the musicals to be over before they give us news about Crystal (let’s hope this is the main reason!). But what about the 30th June? Is it a special date? june 30th is usagi’s birthday and they have special events planned where they announce special news & such. Oh yes, I had forgotten it was Usagi’s birthday! Thank you Trip for refreshing my mind .